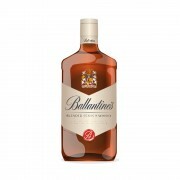 Today, I’m trying the Ballantines 12 Year Old Pure Malt. So no grain whisky was used. It is composed of no less than 40 single malts, including Glenburgie and Miltonduff. The nose offers pears on syrup, marzipan, orange peel and fresh flowers. A bit of smoke, too. Darn, this is pretty good. The medium bodied malt rolls over the tongue, slightly creamy. Nicely soft and fresh with some oak, cinnamon and ginger. For the sweetness, I make associations with oranges and vanilla, for the bitter touch I’d say almonds. The finish is shorter than I would have hoped and ends on almonds. Given the fact that a bottle is less than 30 EUR, this is a great whisky. The motto on the label says it well: ‘Amicus Humani Generis’ means ‘a friend for all’. I can relate to that. This is indeed a good whisky to put on the table when having a nice evening with friend (those you don’t want to break out a single malt for, that is). Thanks to Luca in Sicily for the sample. Hi @markjedi1, it's good to know that someone else confirms my affection for Ballantine's 12. But now I wonder if I am missing something: my bottle actually says "blended Scotch whisky", and Ballantine's website confirms that grain whisky is added as well (so not a pure malt). Maybe you got ahold of a special vatted sample that is not listed on their website? But whatever is in it, this is indeed good stuff, and a bargain as well. Whoops, I just checked the website again, and Ballantine's does indeed make a 12-yr blended malt (which I suppose now replaces the term "vatted"). Looks like I was initially thrown off by the incorrect bottle image in your review. Actually the use of the word "blended" by Ballantine's on both bottles, can be a bit confusing. But sorry for the confusion on my part. No worries, @AboutChoice, the actual image of the bottle is not on the Connosr website and I mistakenly chose this one. My sample came from an older - no longer available - bottle labeled 'Ballantines 12 Year Old Pure Malt'. nice review as always! by the way, I saw this coming back in one or two supermarkets, priced at a very interesting 20 euro!